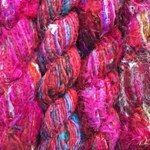 The newest addition to our range of sari yarns is spun from silk sari strips into a yarn. 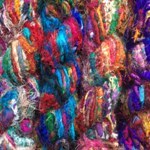 The colour combinations are gorgeous! 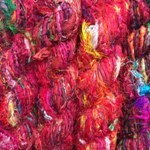 The skeins will be predominantly silk, but there may be some metallic, cotton and viscose fibres included. 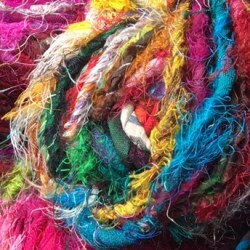 Every skein is unique, the photos can only give an idea.